They're back...again! And they're still looking for Carol Anne (Heather O'Rourke) in this riveting and climactic finale to the Poltergeist trilogy. Sent by her parents to live in a Chicago high rise with her aunt (Nancy Allen), uncle (Tom Skerritt) and cousin (Lara Flynn Boyle), Carol Anne must face demons more frightening than ever before, as they move from invading homes to taking over an entire skyscraper! "Ingenious and cleverly executed" (Los Angeles Times) special effects highlight this haunting chiller that takes terror to new heights! While not as good as the first one... I still enjoyed this one. I would say it is about on par with part 2. Maybe even a little better. Though it is a shame what happened to Heather O'Rourke... what was it shortly after or during making this movie. Passing at such a young age. Still only a child. I keep going back and forth whether I like the new setting of the apartment building. But over all I think it works. I just realized... I just made it to the half way point of my goal for movies!!! Three times is a charm! Charmed: The Complete Third Season has three times the power, as well as all of the supernatural thrills and excitement, as the Charmed Ones -- Prue (Shannen Doherty), Piper (Holly Marie Combs) and Phoebe (Alyssa Milano) -- deal with being modern-day witches. How could life get any more complicated for the Halliwell sisters? One learns that her greatest love is also her greatest enemy; another defies The Powers That Be to marry; and tragedy unexpectedly befalls the third, leaving the sisters powerless to stop it. The perfect potion of suspense-filled adventure, crafty humor and dynamic heroines casts a spell that brings you 22 episodes of pure viewing magic. The Halliwell sisters travel back to the 1600s to protect a coven in danger of extinction and save their own future. I normally don't care for what I call "Period Pieces"... movies/episodes that take place well into the past. But this is definitely an exception. I liked the way that they showed there was a lot of magic know-how lost over the years. And I especially liked the reveal of who it was they went back in time to save. Another really good episode! Tales from the Darkside, the uniquely terrifying, frighteningly popular horror anthology series, is back. Packed with haunting stories that at first light appear to be about normal situations, these tales are gradually twisted until they become something sinister, shocking and totally unsettling. Revealing the dark underworld of our everyday existence, Tales from the Darkside includes stories penned by masters of horror, with unforgettable performances by some of Hollywood's finest stars. Dark, scary and with a bizarre sense of justice, all 24 episodes of Tales from the Darkside's spine-tingling first season will capture your imagination...and never let it go. Some unusual late-night visitors darken a miser's doorway after he dares his neighbors to send their children into his haunted house. The Halloween episode of the first season of this series also just happens to be the pilot episode. I really enjoyed it. Trick or Treat has a cute story... with a fun ending. I hope I am not alone here in thinking this is an enjoyable sequel. I keep going back and forth whether I like the new setting of the apartment building. But over all I think it works. I'd say it was the main reason this still felt fresh! Something is killing off townsfolk in Tarker's Mills. Something mysterious. Something ingenious. Something remotely human. But the only person in town with the courage to stop this lurking menace is a 13-year-old boy, confined to a wheelchair since birth. Adapted to the screen by suspense master Stephen King from his "Cycle of the Werewolf" novelette, this exhilarating thriller features astounding special effects by three-time Oscar® winner Carlo Rambaldi ("E.T.," "Alien," "King Kong"). I have loved it since I first saw it when I was just a teen. I absolutely love the supped up wheel chair... The Silver Bullet! I really enjoyed the scene when he first got it... finding out just how fast it went. I believe Stephen King's take on the werewolf legend is just right on the spot. And I liked who the werewolf turned out to be. While it is not what I would call a gory movie... there is a scene or two that shows it's fair share of blood. There was nothing about this movie that was not just plain enjoyable. It is definitely one of my favorite werewolf movies. Unfortunately this is just a bare bones DVD... no extras what so ever. I would have liked to at the very least seen the Theatrical Trailer on the disc. I imagine there will be many people that does not agree with the below rating... but what can I say... I just love this movie. And it is my rating... so there! Note: The Silver Bullet review above is just a recycled review... don't need to add it to the list. This film is available on a region 2 dvd with the trailer and a commentary track. It's also in this boxset since the dvd is oop and according to dvdcompare Silver Bullet had the same extras. This is one that I enjoyed... I enjoyed it more then I thought I would really as I don't normally like the period pieces. As usual... Donald Sutherland did an outstanding job. As did everyone else... but I have been more and more impressed as I watch more of Donald Sutherland's work. I am becoming a fan of his. There is a nice selection of extras on this disc... but I didn't check them out this time around... decided to save them for the next viewing. Unfortunately there was no Theatrical Trailer on this disc. (a pet peeve of mine) as I like to get in the mood of a movie by watching the trailer first. LOL... that's ok. I can always watch it through DVD Profiler's trailer window... but IO still get mad when they don't have it on the DVD itself. Well... it just felt like it was time to watch a comedy. I enjoy a good comedy horror now and then. I know a lot of people that prefer the TV Series to this movie... and I agree... I do enjoy the series more... but I do still enjoy the movie as well. As much as I enjoy this one... I have no idea why. It isn't particularly that funny... but all the same I still really get a kick out of it.... and keep finding myself coming back to it! I think if you go into this one expecting what it is... a silly, cheesy movie... then I think you will enjoy it. NCIS: THE FOURTH SEASON the top-rated investigative crime drama, continues the thrilling adventures of a cutting-edge crew of special agents who operate outside the government's chain of command. 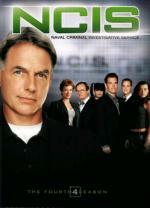 Led by Leroy Jethro Gibbs (Mark Harmon), a former Marine whose skills as an investigator are unmatched, this highly trained, tight-knit team travels the world investigating murder, espionage and terrorism. This 6-disc set includes all 24 action-packed episodes, along with top-notch, behind-the-scenes features, from this critically acclaimed, one-of-a-kind series. On Halloween night a Marine is attacked in his home and his daughter is kidnapped. Meanwhile, McGee and Tony are rendered speechless by Abby's Halloween costume. One of my favorite current shows. This one has a really good story. Not only that... it has some pretty cool costumes. I especially loved our Goth forensic scientist Abbey dressed up as Marylin Monroe. And I had to laugh at Ducky taking the time on the way to a murder investigation to catch a couple teens that egged his van... so he could make them clean it. Very entertaining episode. Witches has been a favorite of fairy tales - and fright films - for centuries. Here's a wicked look at a coven's worth of portrayals. While not bad... movies about witches aren't among my favorites (with 1 or 2 exceptions [The Craft]). I especially don't care too much for the period piece ones. If the story takes place pretty much in the present there is a better chance of me enjoying it. But this documentary did a pretty good job at covering the subject. Though not a favorite short in the set for me. More then just the devil (although the Prince of Darkness has certainly figured into quite a few motion pictures), demons have been a mainstay of horror films since the silent days. For the most part... the movies covered for Demons didn't look to be of much interest to me... at least not the ones I don't already have. So in this case the documentary didn't help me much on movies I will want to add. But it was still a fairly interesting short. Abominable snowmen, mole peple, creatures from the black lagoons. All these half-human/half-beast "hybrids" are here - and more! Now this one I enjoyed quite a bit. It hit on movies I know and have... as well as ones I don't... with a few I am looking forward to seeing at some point in the future. I liked that it hit on all the Creature from the Black Lagoon movies... giving me a look into what I can expect. I must admit that I am a little concerned about the sequel... The Creature Walks Among Us... I mean come on taking him out of the water. Which is probably the reason that it is the last in the trilogy. Horror films have been peppered with people who didn't need makeup and were actually born disfigured, most notably in the movie Freaks. Take a look at those who managed to turn their misfortune into something of a career. This is another really interesting short. Seen several movies I would like to check out. This short made me realize that I never seen a movie based on The Hunchback of Notre Dame. And some of the ones they hit on here looked pretty interesting. King Kong's Fay Wray is probably the most famous scream queen of the horror genre, but you'll be surprised to see who else made the list. Another fun and interesting short. It has those I am familiar with as well as a few I am not. While it did have the older black and white movies featured... this one for a change has more color clips then the B&W.